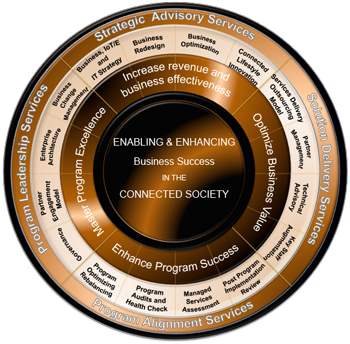 Services Delivery Model: Definition of the program, legacy, and interim organizational governance, processes, policies and models to address all stakeholder needs. Key Staff Augmentation: Temporary fulfillment of key and/or critical skills in the program or legacy organizations required to achieve program success. Companies and Investors: Advising on new opportunities and directions/visions for the future while refining their potential roles and the changes needed to take advantage of the Connected Society. Parhelion-GCA offers independent, innovative and pragmatic strategic advisory services to Service Providers – both communications and other industry verticals – who are looking to be relevant in the new world of the Connected Society.